A vertical diaphragm centrifugal pump provides outstanding performance when transporting heavy liquids and similar materials because it utilizes gravity to improve efficiency. As its name implies, the pump uses a vertical orientation to transfer heavy liquids and slurries. It also excels at pumping water and light-viscosity fluids due to the orientation of the pump shaft. Vertically oriented pumps use less space than horizontal pumps, which enables more of them to be used in one location. They also excel in industrial capacities when there is highly restricted ground area available for use. A vertical oriented diaphragm centrifugal pump enables greater pressure at the Net Positive Suction Head (NPSH). 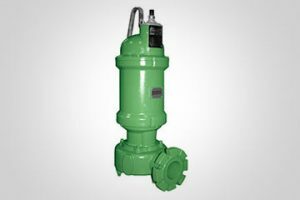 The greater NPSH prevents cavitation, which allows for continuous movement of material that would disable many other types of industrial pumps. The gravity assist feature, combined with the superior design of the internal centrifugal pump, enables a vertically oriented diaphragm centrifugal pump to provide superior industrial capacities. These pumps excel at moving high-pressure fluids under higher temperatures. Higher temperatures mean there are greater pressures, and many competing pumps are not built to withstand these extremes. When used with a complementary disintegrator pump that converts heavy material into a transferable substance, the vertical diaphragm centrifugal pump becomes an essential part of many industrial operations. A disintegrator pump pulverizes large material to prevent blockages and keep material laden fluids flowing. Maintenance always is an important factor with any vertical pump and complementary disintegrator pump to ensure peak efficiency and flawless operation. Critical components, including pumps, shafts, gearboxes, strainers, valves, drives, motors, and other fluid processing equipment, all need regular inspection, maintenance and occasional upgrades to operate at the expected levels. Arroyo Process Equipment has more than five decades of experience in providing solutions for the fluid processing industry. With locations across Florida and in the Dominican Republic, Arroyo Process Equipment is well equipped to offer complete, custom turnkey pump package solutions to facilities in Florida, Georgia, Alabama, South Carolina, North Carolina and nearby regions. Our network of global distributors are available to provide on-site installation, maintenance and repair services. Contact us today for a vertical diaphragm centrifugal pump quote!